Fr. 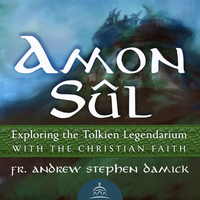 Andrew Stephen Damick launches his new podcast with guest co-host Steven Christoforou, sharing their mutual love for the works of J. R. R. Tolkien, and discussing how journeying through Middle-earth helps us on the journey through our modern secular world. Fr. Philip LeMasters reflects on the parable of the Publican and the Pharisee. Dr. Rossi discusses the temptation towards sexual lust and the power of Christ that helps us to overcome these temptations to sin.